SIS LIVE launches Tr-uPod satellite uplink antenna. 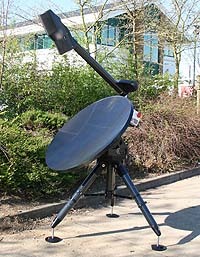 Milton Keynes, United Kingdom, 21st April 2011: Outside broadcast and satellite uplink specialist, SIS LIVE, has introduced its new Tr-uPod antenna at NAB. The compact satellite uplink system features an advanced composite antenna design, tool-less assembly and fully automated or simple manual operation. The multi-band antenna is available in 0.75, 1.0, 1.2 and 1.5m versions. David Meynell, Managing Director, SIS LIVE, said: "Tr-uPod is a robust, highly portable tripod antenna aimed at a variety of field applications. SIS LIVE has made significant investment in carbon tooling." The robust, high-stability tripod system can be set up in minutes and in automated mode, using SIS LIVE’s in-house differential antenna control system. It will find any satellite in an instant. The system has been built to withstand the tough conditions in the field, with an operational temperature specification of between -4ºF to +140ºF (–20 to +60ºC), weatherproof to IP65, MIL STD 810F compliant. All size antennas pack to 2 x IATA carry cases which can be flown as standard airline baggage and easily carried over rough terrain.